Science is science, anywhere in the Nation. The following is a blog post from Luke Laurie’s Blog: Teacher Blog. In this post, I explore reasons why implementing a National Curriculum is a vital piece for future educational and economic policy. I also discuss some of the guiding principals that must be adhered to in order to make a National Curriculum functional and applicable. The vastly different expectations for students in each of the fifty States is archaic and parochial. The technological, scientific, and ethical challenges our nation faces are not regional, they are universal. This is not a liberal or conservative issue. This is an issue of national security. We need to look beyond the old notions of townships community schools serving the needs of the local community. The vast majority of our students won’t be working on the family farm or taking over the mom & pop. They will be out there, in the world. They will move to where the work is. They need concrete knowledge of a complex world, and preparation for a workforce in an uncertain future. What do we say by NOT having National Standards? By not establishing and implementing clear national guidelines for curricula, we have tacitly accepted that what we teach our children really isn’t that important, and that States and localities are equally qualified to determine what form of education is best suited to the future of the United States of America. By clinging tightly to the totem pole of local control, we are denying pursuit of progress that’s in everyone’s best interest. Ironically, by passing the buck to lower tiers such as school districts to develop curricula, we impose undo burdens on these resource-strapped institutions. This blessing of local control becomes a curse of endless cycles of trial and error in curriculum development in small, isolated geographic regions. Some districts have found success, only to see their work destroyed by another cycle of textbook adoptions. Others continue to find a cohesive program that works, and would welcome a functional curriculum structure. In scattered schools and districts across the U.S., we’ve invented and destroyed the metaphorical wheel, thousands of times over, and we still can’t make it roll. A balanced approach to National Standards would take away some of the guesswork in designing instructional programs, and save the time and effort of education professionals for the more innovative and creative tasks associated with delivering instruction. How many creative educators have spent years designing units, programs, or courses, only to see them swept away by changes in policy, funding, or curriculum? A national curriculum could provide the stable foundation that educators need on which to create innovations in education. Every day we hear policy makers and academics talk about how to improve America’s schools and the “school system.” But until we have a common framework between states, we have no real “system” to improve. That framework should begin by deciding what should be taught. What we have now is a failure to decide. If we are to implement a National Curriculum, we need a clear set of guidelines for what education is really for. The curriculum should fit the larger vision eduction vision, and the education vision should, in turn, fit the national vision. But foresight is not an American value, and it’s certainly not a defining property of our public policy. America needs to recognize that many of the assumptions guiding its economic policy are at odds with the realities of today’s global economy. Its performance in a broad range of areas—including saving, education, energy and water conservation, critical infrastructure, R&D investment, and workforce upskilling—is far below the standard of many other nations. America needs to understand that its refusal to have a broad competitiveness policy is, in fact, a policy. And it gives leading U.S. CEOs no choice but to play into the strategies of other countries. This policy, according to its proponents, leaves decisions to the unseen hand of the market. Actually, however, it leaves them to the highly visible hands of lobbyists and foreign policymakers. It is a policy that ultimately leads to impoverishment. I don’t typically chime in on the scare tactics of xenophobia, but in this realm, the U.S. is completely vulnerable to the whims and intentions of other, more deliberate nations. There’s no invisible hand in China. Nor should we trust the invisible hand to fix our most valuable institutions.We don’t need to fear China and other rising economic powers, we should fear ourselves for the lack of backbone, commitment, and foresight to lead us to create national policies that will enable the U.S. to survive and thrive in the future. 90% of Americans attend public school for a large portion of their lives. There is no other institution so clearly capable of shaping the future of the nation. A National Curriculum must be based on a national vision for public schools. Agreeing on such a vision has been avoided by policy makers throughout the history of public schools, because of the existence of so many differing viewpoints on the matter, and the acknowledgement that we have designated schools as the catch-all social institution. Schools are tasked not only with academic education, but are also responsible for health and well-being, drug, alcohol, and disease prevention, and fostering cultural changes; i.e. tolerance education, sexual harassment prevention, and dealing with any issue that is not be addressed in the homes and communities of students. Some believe our schools exist to make good citizens of a democracy, others say to achieve individual economic potential, and still others claim that public schools are the great equalizer, fulfilling a civil rights role. Learning is inevitably part of each vision, but agreeing on the primary purposes for the learning will influence how we go about teaching. Teachers themselves, possess different philosophies on their role and purpose, and consequently approach their work in different ways. In addition, various policies and legislation have added additional tasks, often well-meaning, but overreaching the limits of resources and time. Note that I am not arguing the virtue of these goals, they are all valid societal objectives. The issue here is that we have created an undo burden on a single public institution. Consequently, we arrive at a situation where schools have been tasked with seemingly impossible goals. They exist to educate all students academically, while simultaneously overcoming any shortcomings of the family, community, or the nation. They are to do so with extremely limited resources. And even when they succeed in some areas, they will inevitably neglect others. It’s not just the raised bar that makes schools “fail”, it’s that there are hundreds of hurdles, and no one can even keep track of all of them. In essence, schools have the function of providing for nearly every need, for nearly everyone, until they reach the age of adulthood. The inability of any adult to function in society or to have requisite employment skills always reflects back on their education. A National Vision for Education needs to acknowledge that schools will inevitably serve a variety of purposes, but these goals must be carried out within the context of serving a unified national purpose. Education should be by design, not just a result of historical peculiarities. Developing such a vision will not be easy, and is most certainly not the work of a single individual or organization. So what is this vision? What does it include? How different is what we should do from what we are doing? What new topics must be addressed? What historical baggage must we shed in order to evolve? So, you may have heard of the new video and movement, Move Your Money, encouraging the patrons of big banks to move their accounts to small community banks. The video is quite compelling, featuring clips from It’s a Wonderful Life, along with damning clips of modern bank malfeasance. The video is worth viewing, even if the argument doesn’t sway you. The premise is simple: hit them where it counts, in the pocketbook. It’s a grassroots attempt to undermine the “Too Big To Fail” institutions who continue to be found, time and time again to be complicit in or responsible for economic travesties, big and small. Senator Bernie Sanders has his own idea: Break ‘Em Up. Of course, small town banks can engage in their own shenanigans. They also may not have the capacity or breadth of services for all customers. But we should be good consumers and move our money where it serves us best. If I ever have any money, I want some interest from that money, and it sure would be nice if some of the money was in turn invested in my community. I certainly don’t want a slice of my hard earned money to pay for six-figure financial services lobbyists who are tightening the screws on ethically challenged Members of Congress. I think I just might move my money. I’ve always been a believer in hard work. Indeed, for most of my life I’ve worked hard, probably too hard sometimes, at my job, my hobbies, and my projects. Weekends, evenings, and vacations have all been sacrificed for my commitment to my career. For the most part, I’ve been rewarded for my efforts. But I recently came to a conclusion that made me question almost everything I do, when I suddenly realized the cards are stacked against me. My bootstraps are tearing. I realized- Money makes money better than work. I’ve been going about this all wrong. My efforts at work barely matter in our economic structure, unless I do something differently, my family will be confined to our caste for my entire life. No matter how much I devote myself to my work and extra projects, I will never be as well off as someone who started out rich, even if that person never worked a day in their life. In this blog entry, I’ll explore some of the financial differences between the rich and the working, and show a principal flaw in “trickle down” economics. This brief analysis will no doubt be simplified, but be no less true than a more complex analysis. Over the course of my career, I will make an estimated 2.5 million dollars total. I’ve been a teacher for 12 years. For my first few years, I was paid at poverty level, my next decade at lower middle class, and for the rest of my career, I’ll be paid a middle class salary. If I had not quickly achieved my master’s degree, the poverty level wages would have continued for most of a decade. Most teachers don’t stay in the field that long. When my home is paid off, I should be comfortable, barring a medical catastrophe. I will never be rich. I will be able to retire if the system remains solvent. How does my income and lifestyle compare to someone, who, instead of working, begins the game with the same amount I will make over the course of my life? Let’s image that someone is fortunate enough to begin their adult life with 2.5 million dollars. They didn’t earn it. They just got it. Perhaps there was some “death tax” on it, perhaps not, but there are very easy ways around estate taxes, and when you’re rich, its easy to pay someone to figure them out. In this comparison, I’ll refer to the person with income like mine as the worker, and person who begins with 2.5 million as the heir. Worker: Early in the worker’s career, she survives on about 20k annually. She drives a used car, rents an apartment, and bargain shops. Her income is entirely devoted to basic living expenses. Food, housing, medical expenses, and transportation. She likely is accruing debt during this time in her life, with the hope that future earnings will allow her to pay this debt off. She has no disposable income. Heir: Without any work at all, and without any creative investing whatsoever, the heir can expect to make a minimum of 100,000 dollars on simple interest annually. Naturally, the heir would be tempted to make investments with higher potential return, but would be equally likely overspend. By spending a million dollars upfront on cars, real estate and other luxury items, we can chop the Heir’s savings down to only 1.5 million. With very safe investments, the Heir can still look at making an easy 7% return, which puts him back to generating $100,000 annually without work, with a million in swag. He eats well, he drinks well, his expenses are not confined to necessities. He has tens of thousands of dollars in disposable income. Worker: If she’s fortunate and frugal, within a decade, she’ll be able to scrape together a down payment and buy a modest home. She will pay for this home for the next 30 years, and by the time she’s done paying for it, because of compound interest, she will have paid for the home two and a half times. She’ll pay nearly half a million dollars for a home that’s worth $200,000. Heir: The fortunate son doesn’t need to worry about a loan and overpaying for real estate. He can pay cash for a home worth $500,000. He actually gets what he pays for. If he decides that he wants income properties, he can pay cash for property that will guarantee income. In most markets, he could leverage his cash, putting only half down for the property, borrow the balance, and STILL be guaranteed income. As a landlord, he can write off any improvements, repairs, or upgrades to these properties, unlike the Worker who’s stck with the bill for every broken thingamajig. His 500,000 dollars cash could easily turn into a million dollars in real estate, with the capacity for paying for itself. The Heir does not have a mansion in this scenario, but makes real estate decisions that will not necessitate having to work for a living. Worker: Without significant sacrifice, amassing any sizable savings will not be possible in the worker’s first decade of her career. If she has children and a family to support, this will become increasingly difficult. Not until midway through her career will she start to get ahead. More likely than savings, the Worker will be amassing debt. The degree of this debt will affect her ability in the future to accrue savings. Heir: The Heir starts with income generating savings. By keeping some of this income, the Heir has an income generating perpetual motion machine. Let’s say, for example, the Heir begins with the 1.5 million in savings as described above, and he makes 7% interest on the money from investments. He spends half of the interest income, and returns half to the pot. We’ll say he puts a paltry 3% interest back in to the savings. He’s blowing 60,000 dollars a year in disposable income. Result: In 10 years, the 1.5 million in savings is now 2 million. He does nothing, and his net worth grows. Worker: Of course, the worker works. She spends most of her days at work. She schedules appointments outside of her work day. She misses some important events because of her professional obligations. She works when she’s sick from time to time because of her limited leave days. She usually has weekends and evenings to herself. After all, she’s a college educated professional and deserves some leisure time. Heir: The Heir doesn’t need to work. The interest his money makes provides him with more consumable income than the Worker could ever hope to have. Perhaps he’d be tempted to spend even more of that money, because he needs to do something with his time. He has 365 leave days each year. He stays home when he’s sick, and can devote his time to thinking about ways to have his money make even more money. Worker: By and large, the worker will have few, if any investments. She might consider her home an investment, and in a good housing market, it might be. More likely, others will invest in her, requiring her to pay them interest. They’ll loan her money for cars, for real estate, for home improvements, and for month to month expenses. They’ll invest in her vacations and earn 10% or more on credit card interest. She’ll feel lucky about all the great things she’s gotten to have and do with the borrowed money, but all the while, she’ll be paying extra for almost everything. Heir: The Heir’s money makes money. He doesn’t borrow, unless it’s for short term leveraging, or unless it’s like the real estate scenario above, where he can increase the long term earnings on his investments by accruing more appreciation by having a greater number of assets. He may own stocks, bonds, real estate, or other securities. Interest is good for the heir. He is paid interest. Rent is good for the Heir. He is paid rent. He’ll scrape a little off the top to pay a financial advisor who will constantly look for the best ways for his money to make money. Worker: Many might assume that this category is where the tables would be turned, where the worker, due to his deductions and so forth would have a distinct advantage over the Heir. They would be wrong. The worker pays income tax, sales tax, property tax, and payroll taxes. Approximately 15-20% of her income will go to income tax and payroll taxes, about 5% will go to property tax, but only about 1-2% would go to sales tax. During her career, she will have about $600,000 of her income go to taxes. That’s more than she paid for her home. The taxes the worker pays directly reduce the worker’s quality of life, ability to save, and financial security. But she dutifully pays them out of respect for her country. Heir: The Heir pays income taxes on the interest income on his investments, and capital gains taxes on the sale of investments. He, of course, will pay significant sales taxes on all of his spending. With the 100,000 annual income described above, he could expect to pay 30,000-40,000 in taxes, considering his properties, transactions, and investments. These taxes aren’t preventing him from getting ahead, they just slow down his disposable income a bit. His investments, holdings, and net worth continue to grow regardless. The high tax rates imposed on the wealthy only slow the rate of the growth of their wealth, they don’t make them poorer, as some may try to make you believe. Income tax on investments and capital gains slice into his profit, not his wealth. But many wealthy Americans don’t feel obligated to even pay the taxes they are legally obligated to pay. After pressure from the US, Swiss Banks recently agreed to turn over the names of American account holders who were using Swiss accounts to avoid taxes. They all thought they were in a James Bond film. The IRS, in an effort to increase Federal revenues, thought it would be a good idea to pardon some of these felons. They offered an amnesty program in which millionaire crooks would avoid prosecution in exchange for PAYING THEIR TAXES. How many rich American crooks came forward when they knew the game was up? 15,000. Billions in taxes. Thousands of unethical wealthy people. Read this article for more on the amnesty for rich tax cheaters. The Worker, if she’s fortunate will be able to live a modest, stable life, and be able to retire with some degree of security. The Heir will watch his holdings balloon over time, and could easily have many times the amount he started within a couple of decades. The cards are clearly stacked in the Heir’s favor. The Heir has no grounds to complain about tax policy, estate taxes, etc. His gravy train is firmly ensconced in the tax codes and our economic structure. The Worker, in this case, a public school teacher, must be content in knowing that her life of work is doing good, that the Heir’s tax deductible donations will never do. The rich will get richer, and the workers will keep on working. Or, one can get cynical, realizing that working is futile, and find a way to get a hunk of cash and sit on it. It’s clearly the American way. I gave the following speech at the BTSA End of the Year Seminar. Thank you. I am honored to speak to you today. I started teaching 12 years ago, before BTSA, I think. If there was BTSA back then, I didn’t go. Was there BTSA? Am I in trouble now? I was trained and credentialed to be an elementary school teacher, but somehow found myself becoming a junior high science teacher running a robotics engineering program, and working in the U.S. Congress. One’s life and career path can be difficult to determine. We face obstacles, we have opportunities. We make choices, and the paths of our lives are made. From where I began, I could have in no way predicted that I would be where I am now, in my career. I was sure I’d be teaching upper elementary. I didn’t even get an interview in the districts I thought I wanted to work in. I went from a long term sub position in a bilingual K-1 combo, and two weeks later, I was a Junior High Teacher, and I have been ever since. I’m happy where I am, but along the way, there have been many factors outside my control. When I started, I entered a teaching world that was a maelstrom of chaos. My school was busting at the seams. A junior high with over 800 kids. We were on four track year-round. We had 6 periods a day. I taught 2 periods of math, 2 of science, and one of PE. Everything I had was on wheels. I changed classrooms every month for two years. I belonged to three departments. My colleagues were full of great, innovative ideas, and long held traditions about how things should be done. But I had little time for any solid mentoring. I was treading water. And just when I got to know someone, they went off-track. My BTSA was something of a trial by fire. We didn’t have the Williams Act back then. I got to use whatever math books I could find, whatever everyone else wasn’t using. Same with the science books. My support provider was Rogelio, the night custodian, who would talk to me when I was still at school at 6:00 PM. I had a degree of autonomy that I probably shouldn’t have had. I had the liberty and the obligation to design my own program. I didn’t have much direct guidance, but at the same time, my instruction wasn’t genius-proofed either. On my first day on the job, the principal came up to me and said “You’d be a great MESA advisor.” “What’s MESA?” I said. It’s an engineering program. You’ll get paid 500 dollars for doing it! 500 dollars, “Wow!” – I thought. Little did I realize that the stipend was equivalent to minimum wage at the time. But I’m still doing MESA to this day. Teaching engineering and working in extracurricular programs became an important part of my career. I said yes to a lot of “opportunities” and I still do, probably more than I should. But each of these activities, workshops, conferences, mentoring and other programs I have done taught me something. Most importantly, by interacting professionally with colleagues outside of my classroom, I have been able to interact with fantastic teachers from throughout the region. There’s more order to things now. More order in teacher preparation and mentoring. More order in our school district with a conventional calendar and smaller schools. No Child Left Behind has certainly put things in focus; perhaps an extremely narrow, myopic focus. I still teach three different classes, but they’re all science now, and they’re not all on the same day. But there are still many factors outside the control of classroom teachers. California’s budget crunch may undo the progress we’ve made. 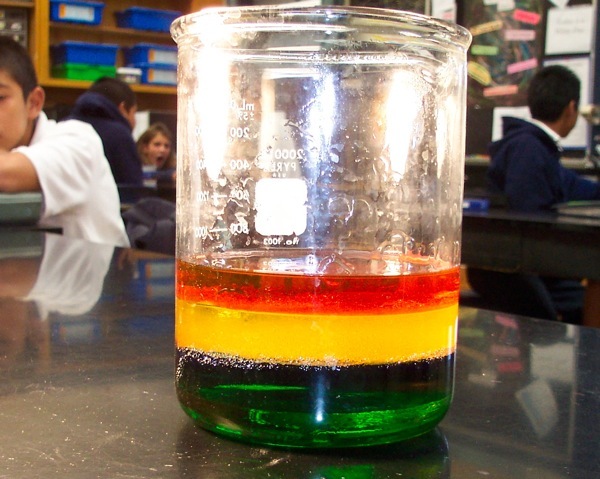 I may have 38 students in my classes next year, 38 adolescents crammed into a room and expected to learn science- a situation I have never had to face. The greatest struggles, in our lives, and in our careers, are rarely the ones we expect. But the opportunities can be equally unknown. From the time I began my career as a teacher, I wanted to be an innovator. I saw education as a broken machine that needed to be fixed. I wanted to do things differently. I wanted to do them better. But, I also assumed that no matter what experiments I tried, or new methods I developed, I would face conflict and resistance from my colleagues and administration at every step of the way. As is the way of youth, I was wrong, about many things. My initial forays into innovative education included teaching kindergartners about astronomy, turning a junior high math class into a stock market, and having my science class spend weeks building insect collections. I was never quite sure of the kind of reaction I would get for my different approaches, so I didn’t always advertise what I was doing. I was shocked at times by the degree of autonomy I was given, and the latitude I had for experimenting with pedagogy and content. I was strongly supported and encouraged by my colleagues and my administration. I was surprised that people had faith in me. One day, while my students and I were on an unscheduled field trip to the park across the street, swinging around insect nets, my principal came walking across the street. I was sure I was in trouble. Thoughts ran through my head — Was it the homemade insect nets made with sharp bent metal coat hangers? Was it the poisonous acetone we were using to kill insects? Was it the fact that we were off campus without permission? But then she took out her camera and started taking pictures. She was so excited to see the kids outside, exploring their world. She said this was the kind of thing our students needed more of. I took this to heart, and continued to develop my teaching skills and acquire resources that would help my students learn things they might not learn anywhere else. Working with technology. Building robots. Learning to program. Camping. Visiting colleges. Making movies. All of these things became a regular part of my work. I’m not very good at some of the ordinary things about teaching. I can’t stand grading papers. I’m not so good at teaching writing skills. I don’t make very good use of the materials that come with the textbooks. I have a very hard time using anybody else’s lesson plan or science lab. So, I build on my strengths. I’m good at building LEGO’s. I like technology. I have a knack for motivation and discipline. It took me a long time to reconcile the fact that I will not be good at all aspects of teaching. As my 8 year old son says to me, “Get used to the facts, Dad.” But there are many ways of being a great teacher. So, I have taken my strengths, and avoided my shortcomings, and built a teaching style that I am comfortable with, but one that has also earned me accolades. I didn’t teach to the test. I threw out traditional methods in some cases. I didn’t do things by the book. I invented my own units, my own class even. In 2000, I received a Crystal Apple Award. In 2005, I received the Amgen Award for Science Teaching Excellence. We provide a certain finite set of inputs through the structure in schools, often insufficient resources, funds, staffing, and offerings —and then a miracle occurs, —and then our students are ready for college, their careers, and their lives. But what is that miracle? In the mess of standards, lesson planning, curriculum materials, and benchmarks, sometimes we lose sight of the simple fact that the the fundamental unit of education is the interaction between the teacher and the student. Teachers and the things they do make everything else possible. Teaching is a human interaction, a social interaction, a personal interaction. It is magical. It is unique. It is unquantifiable. I used to go to an Indian restaurant where the waiter and I talked often. He told me “Teaching is the Path of God.” I didn’t argue. Culture continues, and evolves through us, and Youtube, and FOX news. There’s a teacher in a public school classroom who has knowledge, skills, and wisdom; and there is a student, who is in dire need of that knowledge, those skills, and that wisdom. In a classroom, we work to impart those things to that child, or 38. Everything else is peripheral. You are that pivotal piece. You are needed. You are vital. You are the key. We face impossible odds, all the time. We do the impossible. But there are some fundamental flaws in a system that relies so heavily on the self-sacrifice of individuals, the altruism of a few. The faith that we will do much more than we are payed to do. The faith that we will make something from nothing. The faith that we can do without some of things and some of the people that budget cuts have taken away. When we rely solely on faith, that all these wonderful things will continue to happen in schools, sometimes they don’t. In schools where morale is low, where salaries are insufficient, where staff have been cut, where class sizes are unmanageably large, sometimes the miracle doesn’t happen. Volunteerism thrives only in a stable environment. Our faith is not misplaced, there are just limits to what it can do. In 2003, I faced total uncertainty about my future as a teacher, along with many teachers across the country. It was at this time, that we began to implement the No Child Left Behind Highly Qualified Teacher Requirement Nicklby-Cutie. Anxiety spread when the initial information we received implied that most Junior High Teachers in Santa Maria would lose their positions or even their jobs, if they couldn’t quickly acquire new credentials. I wasn’t satisfied with the information I was receiving at the time. I couldn’t believe that the new regulations would be so draconian. So I began my first experience in researching education policy. I contacted the State Department of Education, began reading documents issued by the Federal Government, and wrote a policy analysis that I presented to district administrators and others. I discovered several alternative routes for teachers to become highly qualified that were not being made available. In the process, I faced backlash from my superiors. I was disciplined. Ultimately, the information I discovered became, more or less, statewide policy. In our district’s haste to be compliant, we didn’t give the powers-that-be the opportunity to get the policy right. Some teachers did end up changing positions, some unnecessarily because of confusion and misinformation, others jumped through the required hoops. I hit the books, and picked up an Earth Science Credential. I didn’t exactly change policy, but I did do everything I could to understand policy, and use the information to protect my colleagues. This experience helped pave the way for a new opportunity that I could not have dreamed. In 2006, I was selected as a finalist to become an Albert Einstein Distinguished Educator Fellow. An Einstein Fellow. I was flown to D.C., and interviewed at length for several possible positions. About 15 Einstein Fellows work each year in several government agencies and in the Legislative Branch, selected from Math and Science teachers from across the country. Ultimately, I was chosen to become a fellow on Capitol Hill. Ironically, the conflict I had with my district about NCLB was considered a strong feather in my cap by the interviewers, who believed I had the knack for legislative work. After many interviews, I was fortunate to find a spot working in the office of Congressman Mike Honda, Congressman from Silicon Valley, who was once a science teacher in a school very much like the ones in Santa Maria. I also interviewed for two hours in the Office of Senator Barack Obama, amongst others, and they never turned me down, but I didn’t wait for their reply. I wanted to work in the House. Congressman Honda’s office was a great place to be, and I had the experience of a lifetime. I moved my family all the way across the County into a little place in Alexandria, Virginia. We changed everything about our lives. I was immersed in a world of policy and politics for an entire year. 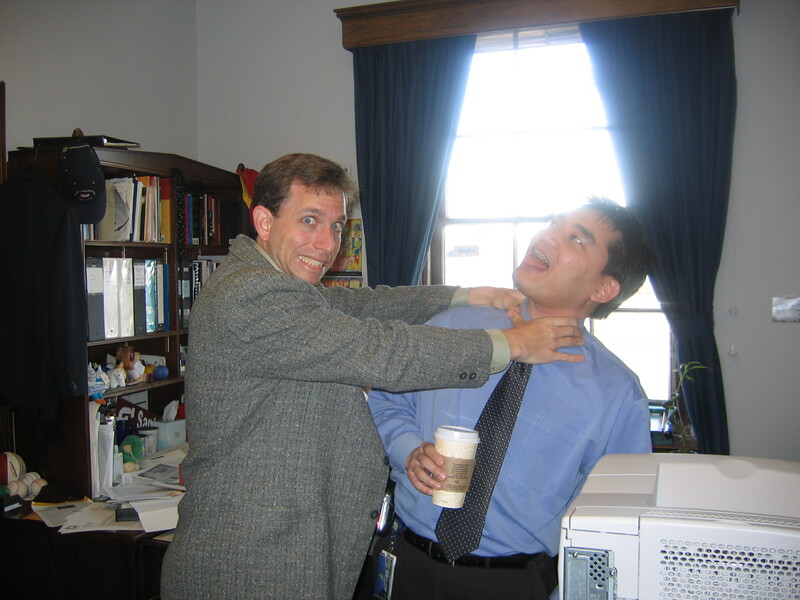 During my year in D.C., I was the principal staff member for Congressman Honda handling Education, Environment, and Homeland Security, as well as Appropriations or funding bills in those areas. I felt like I was a teacher undercover. I got to see education from a very different angle. I also experienced a very different work environment. Education is in a precarious position that not everyone is aware of. While the housing market soared, and the stock market was riding high, schools saw little or no economic benefit. Teachers weren’t collecting massive bonuses or redecorating their offices (we don’t have offices). In fact, many schools throughout this period were dealing with overwhelming class sizes, crumbling infrastructure, and ongoing struggles to provide basic services. Teachers were lucky to get cost of living adjustments, and were even luckier if they managed to keep some health care. Many of us saw real wages fall. At the policy level, we had to fight tooth and nail to prevent proposed cuts at the State and federal level every year. Unlike the housing market, the stock market, and government revenues, education didn’t benefit from the economic gluttony of the last few years, but when everything came crashing down, the funding for schools went with it. The current cuts to education are having devastating impacts in schools across the State and in our region. The Obama administration and the new congress have already begun a massive reinvestment in education at the Federal level, but California’s self imposed cuts may erase any potential benefit from these federal funds. I don’t want to point any fingers, but this is all California’s fault. I don’t want to be partisan, but it’s the Republicans who are forcing the tightening of the budget on education. The 2/3 vote requirement in the State Legislature effectively grants the minority party double voting power on issues of spending and taxation. As teachers we often look at the State and say what are they doing? When I worked in the U.S. Congress, we would say the same thing. If California cannot find a way to markedly increase investment in education, we may look back on these times and laugh that we were actually trying to improve schools. We might be more likely to reflect on this time as the golden age of education, where every school was labeled as “failing”, but they were all better than what followed. Remember when we only had 35 students in each class? Do you remember art class? It is worth noting that the administration and board of directors of the Santa Maria-Bonita school district and some other districts have worked very hard to minimize the impacts of these cuts. Santa Maria-Bonita has managed to find ways to save millions of dollars, largely by the administrators altruistically taking on multiple jobs themselves, and by delaying filling vacant positions. They insulated classrooms and students from many of the cuts, and significantly reduced the layoffs of teachers. We should not have to rely on faith that good instruction and a comprehensive curriculum is being taught in all public schools. We should not have to take it on faith that a student will learn in a class that is twice the size it should be. We should not take it on faith that one person can do the job that two should be payed to do. We need to invest adequate resources, distribute those resources in an equitable manner, and be careful not to impose draconian policies that will inhibit innovative instruction. These are tough times. There is uncertainty. But there is also hope. The infusion of Federal Stimulus Funds is yet to arrive, and Federal Government is likely to continue to increase funding for Title 1 and Special Education. We need to continue to fight, and continue to seek creative solutions for the sake of our children. Some are worried about the debt we will leave them. I would argue that there are far worse things we could leave our children than debt, and the worst of them is an inadequate education. Auto Bailouts- Where’s the Demand for Cars? In the conversation about how to handle the collapse of the American auto industry, a key component of the discussion seems to receive little attention: Demand. Can we honesty have any hope of saving an industry that produces a product that is urgently needed by almost no one? I used to be really into cars. I had VW’s, a ’69 Z28 Camaro, and a ’73 Triumph Spitfire. I enjoyed keeping these machines alive, fixing them up and otherwise relishing a bygone day of automobile style. In 1999, my wife and I bought our first NEW car, a Subaru Impreza. It’s a modest, functional, fuel efficient car. The following year, we bought a Saturn SL2, also a modest, functional, fuel efficient car. Being young professionals, hauling around babies and groceries, and commuting, we felt having new cars was very important to us at the time. Those two cars might be the only new cars we’ll ever buy. We’ve moved up to a minivan since then, but we bought it used. Our newest car today was built in 2002. Living where we do in California, automobile ownership is a necessity, but many urban dwellers have little or no need for cars, and many rural dwellers will be just fine with the cars they have for many years. Collectively, America doesn’t need new cars. There are millions of unsold new cars already. There are millions of used cars that will serve us for decades to come. If we bail out the auto industry, who will buy the cars they build? If you haven’t saved the jobs, but you save the company, what have you really preserved? The economic downturn, coupled with the changing of the guard in Washington, has led to increasing political polarization in economic views. America is more liberal than it has been for many years, and we’ve been voting that way. It is the belief of a majority of Americans that liberal economic policies are what our nation needs to survive. But there is far from a consensus about how we should go about recovering from this precipitous economic decline. We are at a crossroads, where few would suggest that inaction is the most prudent course. Our children and subsequent generations are frequently dragged into this debate. Giving the appearance of the ultimate highest moral ground, conservatives argue that the worst thing we could possibly do in these times, is increase the Federal deficit. On it’s face it is a compelling approach. No one wants to make things harder on the next generation. But are there things worse than debt that we could leave our children? Absolutely. Is the price of ongoing debt maintenance, at pennies on the dollar, really so significant that we should ignore the issues before us? Should we endanger the health of our children, their future job prospects, or possibly even the survival of the human species, just to entertain a fantasy of fiscal responsibility? Leaving our children and future generations with a burden of debt is a small price to pay compared with the what could result from political inaction or insufficient investment in the present. History has shown this to be true. Global Warming: Without dramatic changes in the types of fuels we use, our processes for producing electricity, and means of transportation, we will continue to increase the rate at which we are polluting the atmosphere with excess carbon dioxide and other greenhouse gases. An increase in debt may be necessary to create the infrastructure, incentives, and innovations required to make the technological improvements required worldwide to prevent rising ocean levels, drought, mass starvation, as well as uncertain climatic, biological, and agricultural changes. Inadequate Education: The challenges we face today are pushing the limits of our science, technology, and ingenuity. Perhaps one of the most difficult aspects of responding to a changing world, is that in a democracy, the will to change must be the will of the people. But inadequate education leaves the electorate ill prepared for facing complex scientific, medical, or economic issues. In order to bring about enlightened policy, we need an enlightened electorate that has education and experiences to understand the reasons what changes and innovations are necessary. We can reflect on how we might have dealt with current problems, if only we had been better educated in the past. Investments in education decades ago might have imporved the scientific knowledge that could have enabled swifter changes in energy policy to curtail global warming. Better knowledge of economics and finance might have enabled us to prevent the recent real estate collapse and derivatives improprieties. Better media awareness might have prevented the Bush administrations manipulation of the news and facts in the run up to the attack on Iraq. Better consumer knowledge might have made us less susceptible to manipulation by corporate advertising. Undoubtedly, increasing our investment in education is the best national defense America could hope for, because it will prepare America for the uncertain challenges we will face in the years and decades to come. Archaic Energy: Prior to the massive sequestration of Carbon Dioxide and production of Oxygen that was performed by plants in the Paleozoic, the surface of the Earth outside of the oceans was mostly uninhabitable by non-plants. Now humanity is attempting to reverse this process, by pumping up oil from the Carboniferous, burning it to release the CO2, and decreasing the habitability of the Earth’s surface. What a stupid way to power any kind of progress. Our number two energy option consists of smashing neutrons together to make highly radioactive juice that must be stored in vats FOREVER, with no permanent safe storage facility. There are other ways. Insufficient Health Care: We have, in America, supposedly, the finest health care ‘system’ in the world. That is, if you own stock. Somehow, however, when something’s really wrong with you, you can choose to get treatment, and lose any and all assets you possess, or suffer. Health insurance is becoming a luxury item. Employer-based health care is dissolving. A system that is for-profit will always economize. In business, some things are acceptable losses. You or I might be one. No Access to the Means of Production: A key aspect to America’s growth and development was the wholesale giveaway of America’s natural and economic resources to a privileged few. But the endowed wealthy have never had enough. Economic downturns have consistently resulted from mass redistribution from the many to the few. After all, if most people don’t have sufficient economic resources to expend on goods and services, the economy must slow while the wealthy stow the assets and collect capital gains, which result in minimal economic stimulus. Hard work and creativity are not always sufficient for balancing unbalanced systems of economic stratification. The real way to create a wealthy society is to enable wider access to the means of production, thereby enabling economic opportunities not just for those lucky enough to be from regal bloodlines, but for all Americans. A Dangerous World: Foreign policy that alienates allies and creates enemies can only make the future more uncertain for our children. We cannot afford to make problems that they must solve. A compassionate and tolerant approach to world affairs that fosters peace and encourages cooperation will benefit the children of all nations. Debt? A small price to pay.